This year I focused on art for Edmund’s presents. I got two show pieces. 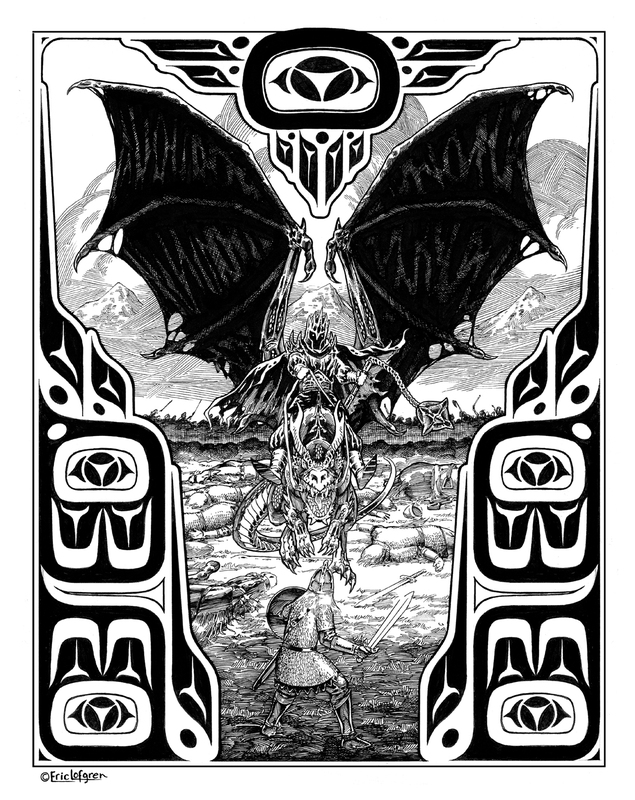 One was Eric Lofgren‘s ink drawing of a British Columbia-inspired Eowyn of Rohan facing the Witch-king on his steed (from an ArtOrder Challenge a few years ago.) I just love Eric’s pen and ink work, and you can see from my choice among his prints a direct connection to Edmund’s choice of presents for me. Great minds, etc…. The other piece was commissioned especially for Edmund. You may have read my summary of the Tianxia: Blood, Silk and Jade (Vigilance Press) game I ran at Big Bad Con in October? 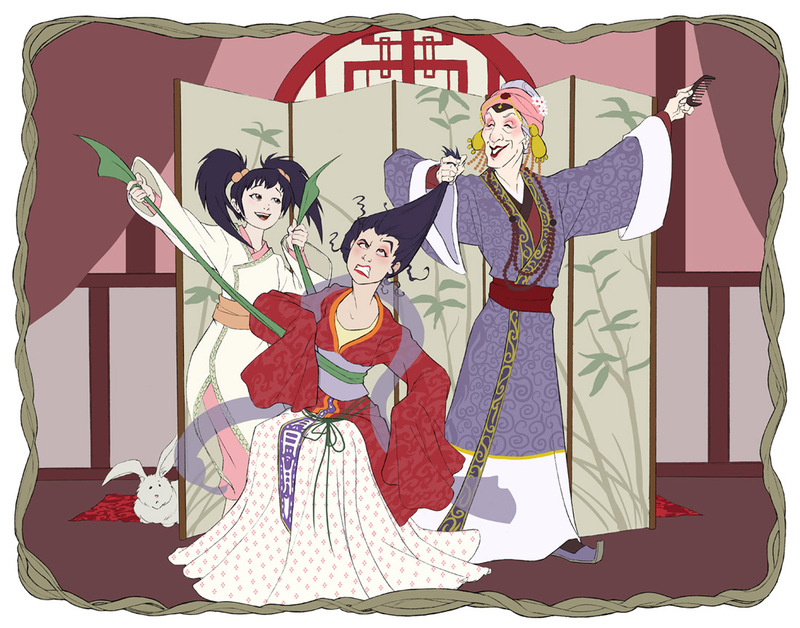 In it was a funny scene where Edmund’s character, the wild forest girl Wolf-Eyed Yue, was made up and disguised as the Moon Festival Princess. First, Denise drew a sketch of the scene as she envisioned it based on my description. Right away, you can see why Denise was the right person to illustrate a wuxia-based game book: she has turned what could have been a very static scene into a dynamic pose. She latched onto what made the scene funny for us in the game: the contrast in moods between Yue and her cheerful attendants, and the physical comedy of putting a wild forester in a fancy dress. To give the sense of tension and action, Denise has the two attendants pulling in opposite, slightly off-balance directions with Yue torn in the middle. Yue’s characteristic wild hair is being tamed, symbolic of the whole predicament. The only change I asked for was to give Yue a grumpier expression, more in keeping with the way our game unfolded. Next, Denise sent the polished sketch in clean lines. Now Yue looks suitably annoyed at the spa treatment she’s receiving! You can see the line weights have been carefully selected to reinforce the opposed movements forming a slightly left-tilting triangle. 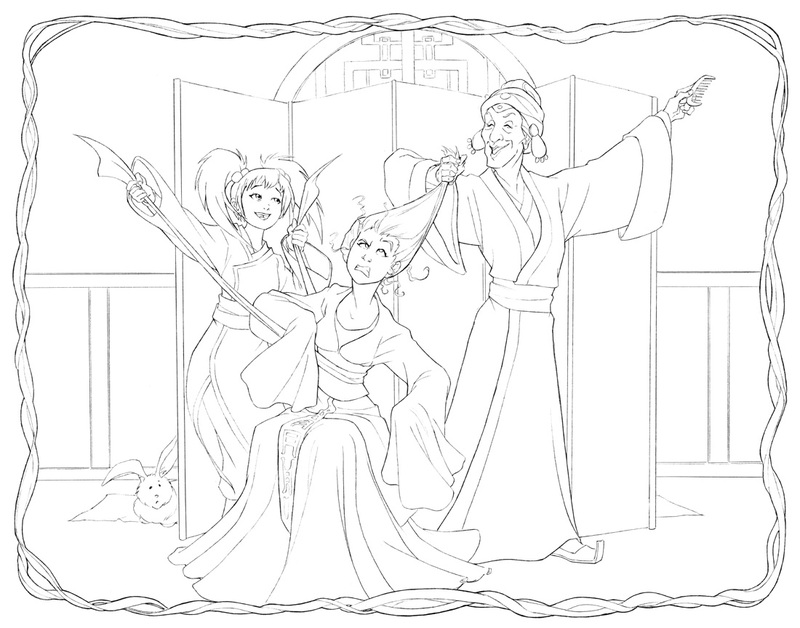 Next came the image with flat colour layout. The light and dark colour masses have been distributed to play with the theme of Yue being pulled in different directions. The violet of the dan‘s over-robe gives her mass and solidity, while the bamboo motif on the screen behind the characters counters this by reinforcing Ping’s movement. Light touches of red cloth to the left and right of the screen, matching the hue of Yue’s dress, now suggest an opposite triangle pointing upward. 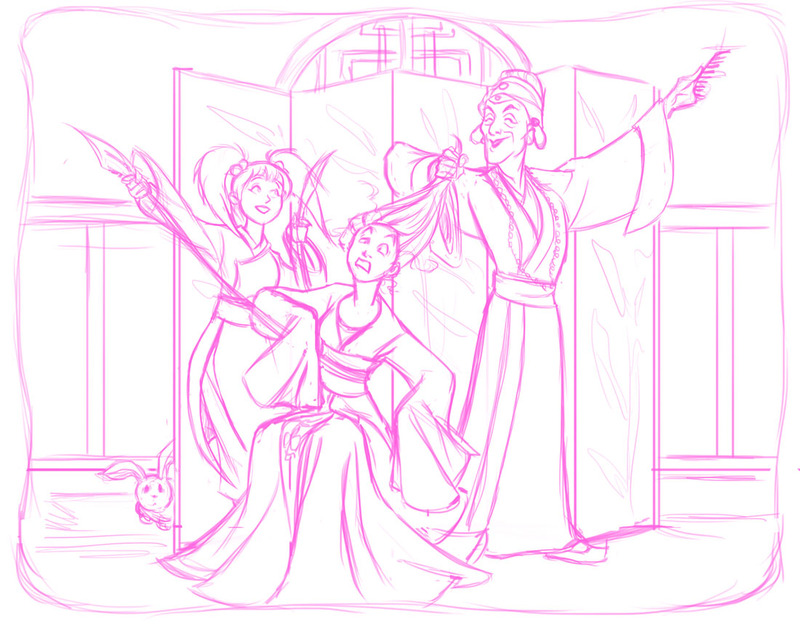 Yue’s scarf ties her to the dan and suggests being twisted out of shape. Shadows and textures make the image come alive and mute the lines to make the effects more subtle. The finished print is 11″ x 14″ (about 28 cm x 36 cm). It’s gorgeous. Posted on December 26, 2014 December 27, 2014 by mechanteanemonePosted in Art, family, games, holidays, rpgsTagged art, books, Denise Jones, Eric Lofgren, family, games, holidays, rpgs. Next Next post: War of Ashes RPG: Social Conflict with Miniatures!